Read&Write for Google is a Chrome Extension that is used within a Google document. Teachers can sign up for premium features free; students start with a 30-day trial; some features disappear after the trial, but many remain. Read&Write assists students in a variety of ways, including speech input, text to speech reading, picture dictionaries, word predictions, and more. The tool that we used most often (in part because it is in the free package) was the text-to-speech tool. This allows students to have just about any document or website read to them by the computer. For an overview, watch this video on using Read&Write in Google Drive. How Do We Use it in an ELA Classroom? The SAS Navigator is a free Chrome App that walks students through the writing process from brainstorming to publishing. The SAS Writing Reviser is an add-on that allows one piece of the Navigator – the Reviser – to be used in a side window within a Google document. The SAS Navigator is a nice scaffolding piece for students who may need writing broken down into smaller chunks. Students can brainstorm ideas and then use drag and drop to order them into an outline. They can compose and save within the platform, and they can get advice in the revision process on issues such as essay structure, sentence structure, wordiness, redundancy, and much more. The add-on does the job of the revision piece of the Navigator, but all from a side panel within a Google Document. I just discovered these tools from SAS Curriculum Pathways, so my students have not used the Navigator yet. My freshmen, however, used the Writing Reviser add-on in their Google document for a paper they were finishing last week. It was powerful! We’ve talked about sentence fragments and run-ons, but they have continued to turn in papers with these errors. When they ran the checks for these and saw their papers light up with highlighting, they finally tuned in to these errors and went to work fixing them. It was a great chance for me to circulate and help students one-on-one understand sentence structure better. We had conversations about why a period was a more appropriate punctuation mark than a comma in a given sentence and discussions about how to correctly introduce a quote that was also a sentence in itself. They were pairing up and helping each other with sentences that were inaccurate. I did issue one warning to my students before they ran the sentence checks. This tool, like any automated tool, depends on algorithms, and those algorithms are not always accurate. I warned them that the tool would probably tag sentences as run-ons or fragments when they were not and that they needed to be careful of that. I’ll say, though, that even this overreach of the tool led to great conversations: “Is that a run-on or not? How do you know?” I can’t wait to use the other functions available in the reviser. The Google Forms app is a standard feature of Google Drive. It is best known among teachers as a tool to survey, formatively assess, or collect information. This underused app, however, has applications that could transform writing and reading in an English classroom. A variety of question types are available in Google Forms. For example, teachers can prompt students to respond to questions that require multiple choice answers, checklists, grids with multiple criteria, short text or paragraph text responses, and scales. If you have used Forms before, you may be familiar with fabulous tools like Flubaroo that let you turn forms into multiple choice quizzes. 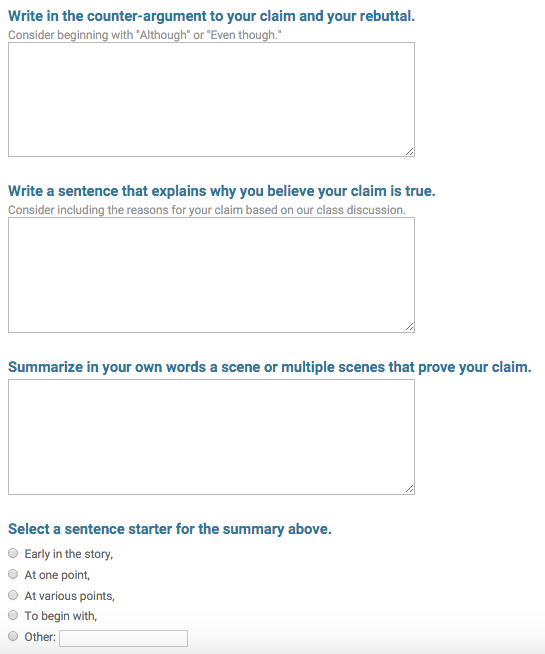 In the ELA classroom, though, I don’t use multiple choice responses much, so I wondered what Forms could do to help my students become better writers. Google Forms can break down a big process into smaller steps that may seem more manageable for students. For instance, my ninth graders recently wrote an argument on The Odyssey, but they were struggling with how to organize their body paragraphs. I created a Google Form that divided building a paragraph into step by step instructions. (See the screenshot at right.) Then I used a Google Sheets add-on called Autocrat to take each part of the form and compile it into paragraphs. Autocrat created a Google document and emailed it to students, who then had their body paragraphs all laid out in a doc. 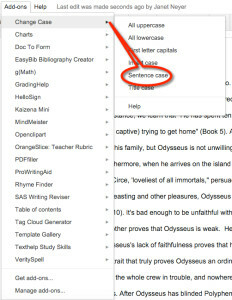 Change Case is a free Google Docs add-on that allows for selection of a passage in a document and then automatic correction or changing of the case. This add-on can capitalize a whole chunk of text (or change it to lowercase), and it can properly capitalize a title. Under “sentence case,” it will capitalize the first letter of sentences and the letter i as a pronoun. My students are used to automatic capitalization on their smartphones, so they were excited to use this tool. This is a simple yet powerful tool for students in the proofreading stage. The RefMe website allows users to collect bibliographic information for building a paper. The phone app allows users to scan a book’s barcode, capture the information in seconds and upload to the user account on the website. The RefMe web clipper extension allows users to capture quotes, information, and student notes directly from a website. RefMe’s versatility makes it a very useful tool for my students. When we head to a local college library for research, students use the phone app to scan barcodes of the books they are using. They use the Chrome extension when taking notes from databases and online sources. Because everything lives in one website, they then can return to that site when assembling their paper. Citelighter is a full website with a Chrome extension that allows students to copy quotes, take notes, capture bibliographic information and organize a research paper. The basic extension is free to use; the Citelighter Premium package is really cool – allows for the teachers to push out organizational structures, watch students’ research process, and check for plagiarism – but there is a fee. Citelighter is research tool for students that goes beyond citation. Students can capture information with a simple click and then incorporate that information into a Google document. Citelighter has an overview video of the basic tool on their website. Students will need to sign up for a free account at Citelighter and download the Citelighter extension to their Google accounts. Then, they should create a new project in Citelighter before beginning their research. Once created, they can use Citelighter to capture sources, take notes, add their own comments, organize their information, and build an outline for their paper. When they are ready, they can click on Write in the toolbar and they’ll be able to create their paper in a Google doc with drag and drop features for their quotes and bibliographic entries. Citelighter is an all-in-one tool that handles some of the time-consuming tasks of research and allows students to concentrate on the writing. Diigo is a full website with a host of tools for capturing and recording information. Diigo has a free plan and four different levels of pricing for upgraded plans. Educators can get a Diigo Educator Account for free here which allows you to create and manage student groups. Diigo calls itself a “knowledge management tool’ which seems like an apt name for a tool that does as much as Diigo does. At its simplest, Diigo can serve as a place to store favorite websites; at its fullest limit, though, Diigo allows for professional gathering of information, note-taking, collaborating, publishing, and sharing with others. Diigo has multiple pricing plans, but the free option is powerful, especially when linked with the Google extension and the new Quick Note tool. There are several different options for Diigo for Education that are worth looking into. Using Diigo in the Classroom is a comprehensive site with video tutorials for teachers and students as well as ideas for classroom use. Diigo helps make research and exploration a more frequent occurrence in classes by giving students a place online to collect and share. EasyBib is a website with a Chrome extension and an add-on for Google Docs. The Bib Creator add-on captures information for students and builds a bibliography page in the style they choose (MLA, APA, Chicago, etc.). Basic features are free right now with this add-on, but premium features (like in-text citations) would cost money. When students are ready to build a bibliography, they can search for or enter the website from which their info was gathered. EasyBib will build the citation and store it. When they have all citation entries, they can click on “Add bibliography to doc” and their info will be properly formatted and alphabetized. My students use the Google document add-on to capture and assemble their bibliographies at the end of a research topic. EasyBib is a quick go-to tool when students need to include source information quickly. EasyBib also offers teachers some great resources for the classroom.